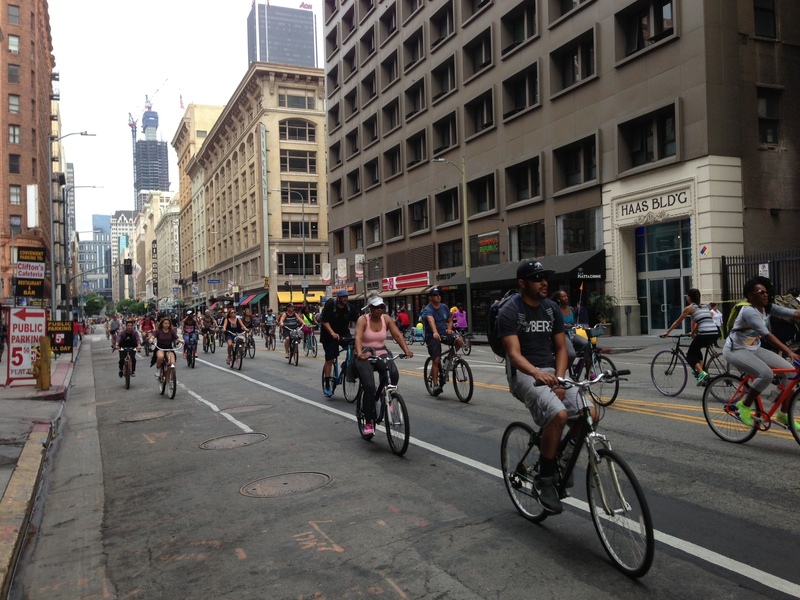 CicLAvia XV takes over downtown L.A.’s 7th Street. 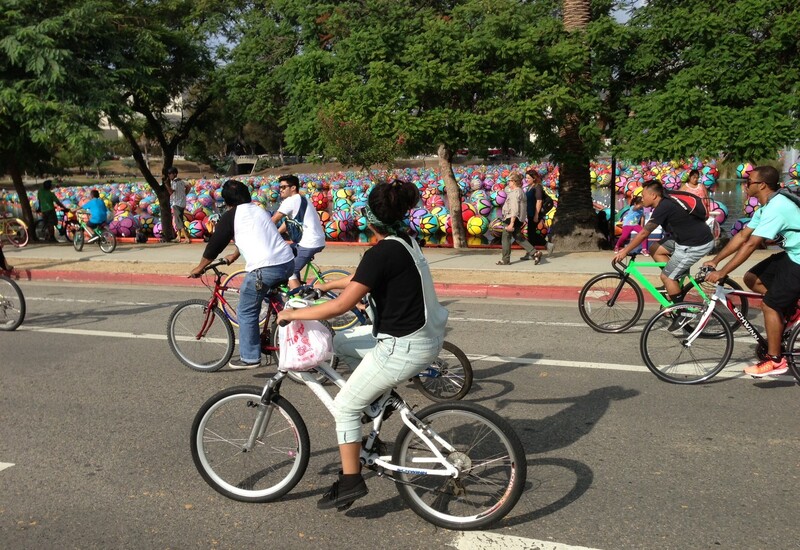 All photos: Joe Linton/Streetsblog L.A.
CicLAvia hosted its 15th Open Streets festival yesterday. The Heart of L.A. route was similar to the now-familiar and always-a-hit initial October 10, 2010, route, with hubs at MacArthur Park, City Hall, and Hollenbeck Park, plus an added spur up into Chinatown. The route included plenty of great architecture, excellent transit connections, and of course tens of thousands of smiling faces. This was the first CicLAvia to be blessed with a bit of rain. Early arrivals experienced scattered showers, which cleared up just before the 9 a.m. start time, leaving the air clean and the route damp. Attendance was abundant, but may have been slightly off due to the rain. 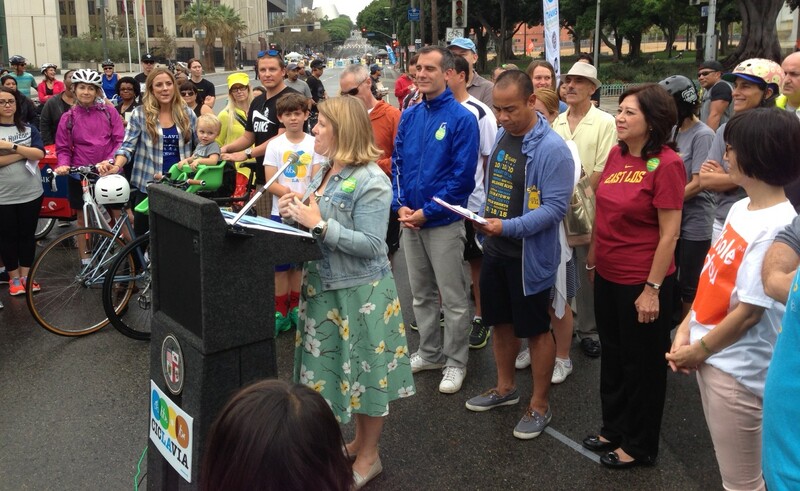 Below are a few photos highlighting the opening ceremonies and the latest great CicLAvia event. One pleasant and unusual site was the Portraits of Hope art installation at MacArthur Park. 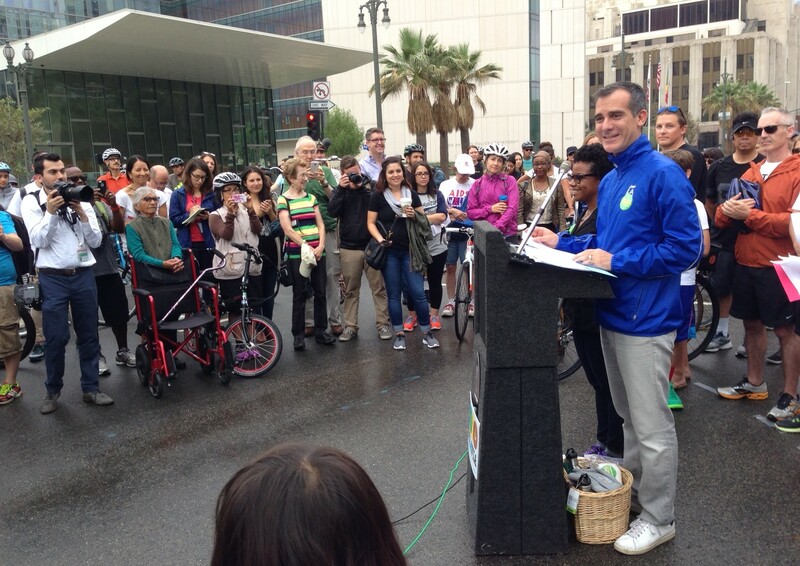 Mayor Garcetti kicked off yesterday’s CicLAvia pledging to make the city of L.A.’s open streets events monthly beginning in 2017. 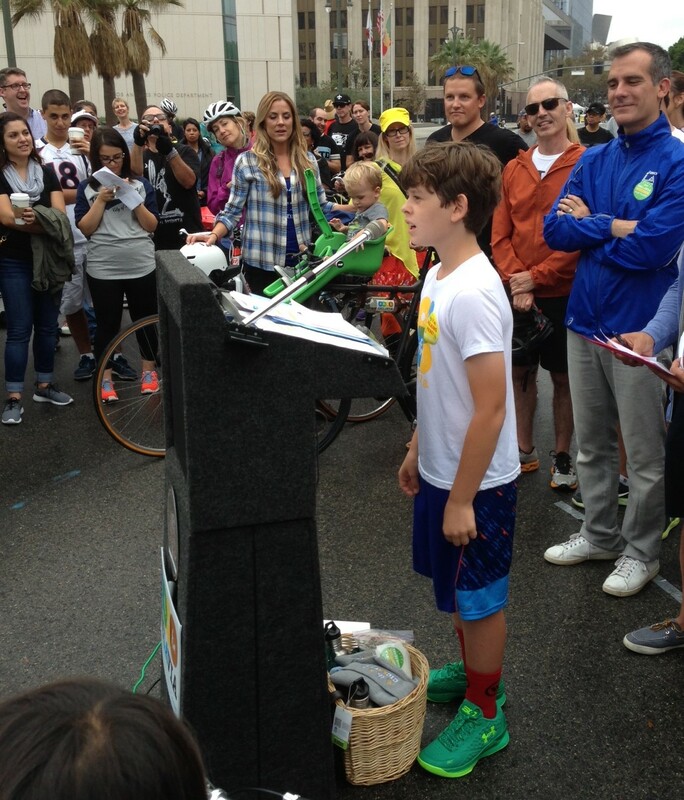 Livability champion and Silver Lake cyclist Matty Grossman kicked off his 2040 mayoral campaign. We knew him back when he was just speaking out in support of the Rowena Avenue road diet. Additional CicLAvia kick-off speakers included LA Department of Transportation General Manager Seleta Reynolds (at podium), L.A. City Councilmembers Jose Huizar and Mitch O’Farrell, L.A. County Supervisor Hilda Solis, CicLAvia Executive Director Romel Pascual, Whole You Chief Innovation Officer Hiromi Inagaki, Pick My Solar founder Chris Blevins, and others. 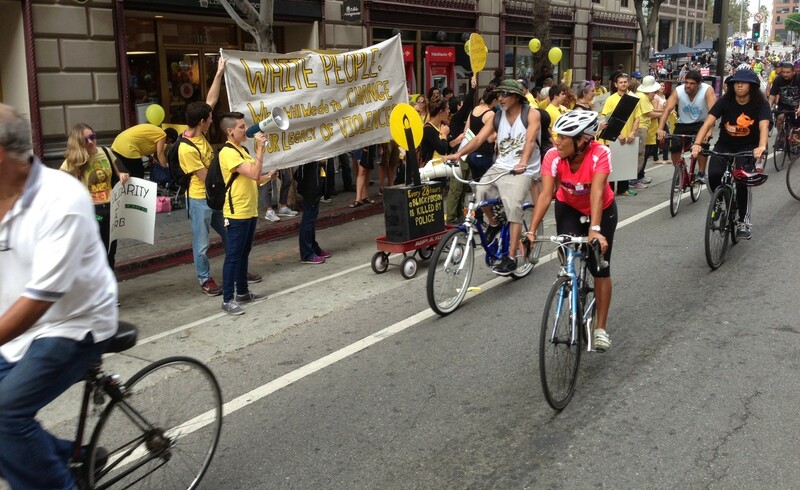 Like in other cities and countries, CicLAvia is developing as a place of overt civic dialogue. In additional to lots of signs promoting Bernie Sanders for President, there was this anti-racist whites demonstration march making its way along the route. 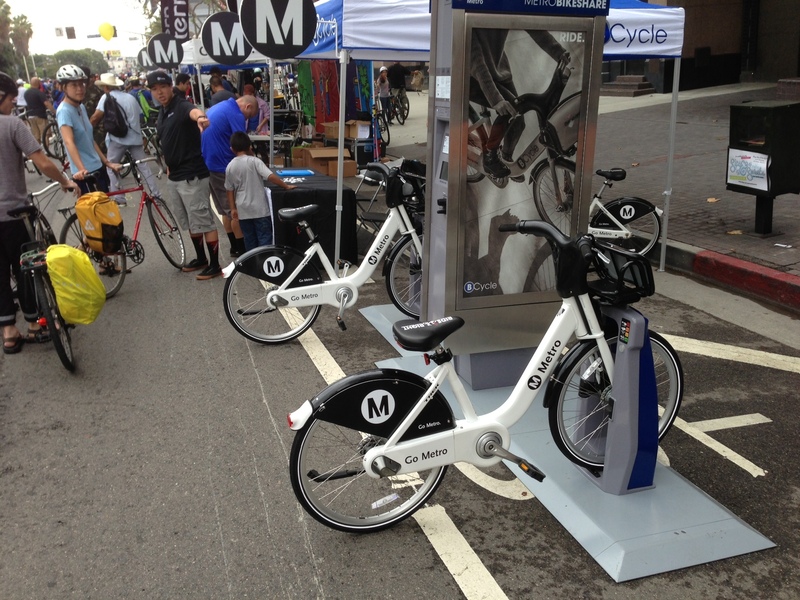 Metro, which sponsors open streets events around L.A. County, was on to demonstrate its bike-share, coming to downtown L.A. next year. How did your CicLAvia go? Share your thoughts, images, etc. via the comments below. For the first time in a while, I got some dude in a recumbent bike telling me to get on the sidewalk when I was walking in the street. As the Ciclavia people keep reminding users time and time again, there’s enough space in the road for everyone, including walkers, joggers, and skaters, to use the street. Had a great #cicLAvia as always. But 4pm is too soon to stop. I still think #cicLAvia should be longer. My son was so sad to leave at 4pm. #cicLAvia after dark would be pretty neat IMHO. I have no idea why I hashtagged that word every time. ＾Д＾；；；Force of habit I guess.